Where is this from? And is it junk? 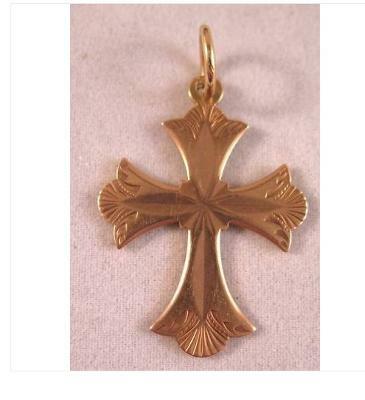 I'm shopping around to purchase a replacement for my great-grandmother's rose-gold cross pendant which I (sob!) lost a few weeks ago. I'm on a limited budget & frankly, know virtually nothing about antique/vintage jewelry. At any rate, I saw this (see attached photo) over the weekend & am wondering where it's from, approximately what its vintage is (assuming it is indeed "vintage" or "antique") and whether it's junk or not. Will very much appreciate any tips you can provide.